Even without Fissure, the Gladiaors were able to sweep London Spitfire in the first match of the OWL playoffs. It looks like a triple support, triple tank composition—Brigitte, Reinhardt, D.Va, Zarya, Lúcio, and Moira. 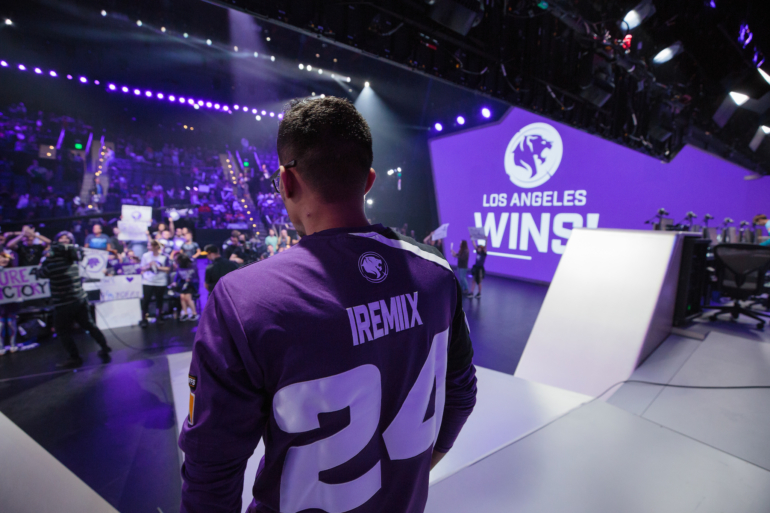 The Los Angeles Gladiators haven’t lined up with a regular composition, but it’s not too out of the ordinary. Then Lane “Surefour” Roberts stays in the King’s Row spawn. He’s not AFK; this is the Overwatch League quarterfinals match against London Spitfire, after all. Surefour looks over at Luis “iRemiix” Galarza Figueroa’s screen, watching the other five players sneak past the King’s Row bus. Los Angeles push past the brick wall and into a left-side doorway. Los Angeles ignores the capture point, tickling London with damage as they mosey on past the defending team. It’s clear at this point that Los Angeles has something planned. The camera blinks back to Surefour, still in spawn. He switches to Widowmaker. It all becomes clear: Los Angeles is setting up a shooting range, designed to push London right into Surefour’s line-of-sight. Close your eyes and we might as well be watching Meta Athena circa March 2017. The South Korean OGN Overwatch Apex team made a name for itself for its creative strategies, often exploiting Overwatch maps to give them the advantage. Meta Athena tried a number of strategies using Mei to boost the squad to heights previously unreachable. The team thrived on their ability to overwhelm enemy rosters with surprise; Los Angeles has ripped a page out of the Meta Athena playbook in that regard. By the time London realizes what Los Angeles is doing—Uh, where’s Surefour?—it’s too late. Los Angeles pops out of King’s Row’s high-ground windows and pushes London past the statue, where Surefour can exploit his spawn high-ground. Ding. Ding. That’s London’s own Widowmaker and Mercy down, and the rest of London follows. That’s an easy capture for Los Angeles. There’s a lot to consider regarding why this strategy worked. London set up a defense expecting Los Angeles to run Widowmaker, but not the strategy they ended up running. That’s why they were set up on the capture point—they needed to stay out of the spawn room sight line. Los Angeles also knew that London would be expecting a Widowmaker, which is why they put Surefour on Brigitte initially. London would push tab to check Los Angeles’ team composition and see that Surefour’s on Brigitte, likely they’d assume he’s part of the massive push toward the point. London was already right where Surefour wanted them when the team realized what was going on. It’s an innovative strategy that exploits meta expectation and map design, and its success hinges on both lining up perfectly. And when it doesn’t, it’s shut down quickly, as evidenced by an Overwatch Contenders Korea match this morning. GC Busan set up with the exact same composition as Los Angeles right down to to hidden Brigitte. The team gets past the King’s Row choke, but Seven knows what’s up. Widowmaker player Park “Bazzi” Jun-ki is in position with his sights set at spawn. Everything goes bad for GC Busan from there. Looks like both GC Busan Wave and Seven watched yesterday’s Overwatch League matches. Yikes. Guess any other team looking to try out this strategy will have to let it rest for a while; it just doesn’t work if the other team is expecting it. And London just wasn’t expecting it. After Los Angeles announced ahead of the quarterfinals match that star tank player Baek “Fissure” Chan-Hyung wouldn’t play much in the Overwatch League playoffs, everyone started doubting the team’s ability to succeed. But Los Angeles clapped back with their big brain strategy, ending the first quarterfinals match up one on London. Los Angeles and London will meet again on July 14 at 2pm CT to settle the score. Only one team will move on to the Overwatch League semifinals.